?2019 Mercedes-Benz CLS 450 Coupe Review? Recently, Mercedes-Benz revealed its latest example of high-performance personal luxury car. 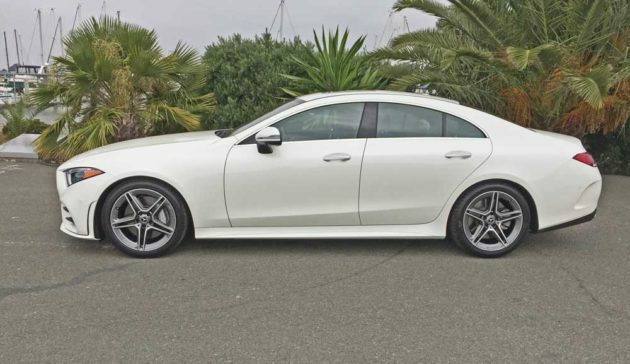 It is the 2019 Mercedes-Benz CLS 450 that skillfully combines the elegant appearance and the engine power and performance of a flashy sports coupe, but with the functionality of a four-door sedan, because in reality, it is in fact a sedan. The interior features display a luxuriousness that rivals that of its competitors. The CLS 450 is based on the new E-Class sedan, which stretches its wheelbase by 2.6-inches and overall length by 2-inches. It will likely be a big hit for the German automaker for a number of reasons. 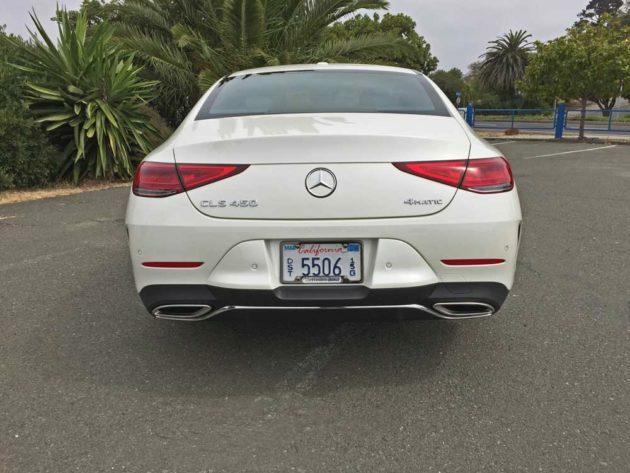 Propulsion for the CLS 450 is unique ? 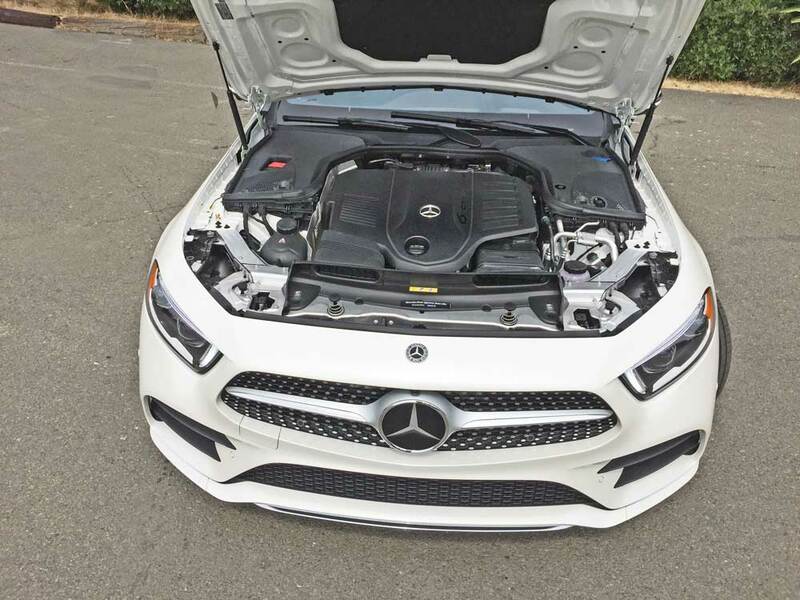 it is supplied by a 3.0-liter, twin-scroll turbocharged inline six-cylinder engine that delivers 362 horsepower and 369 pound- feet- of torque, giving it the capability of turning in a 0-60 time of 5.1 seconds with rear-wheel-drive, or 4.8 seconds when equipped with Mercedes? 4MATIC AWD system. Not so unique you say? Well, what makes it so, is the fact that there?s also a 48-volt mild hybrid system, that powers an integrated starter-generator, that can add up to 21 hp and 184 lb-ft of torque to overall energy ratings. The ?Tri-Star? clan refers to the hybrid system as EQ. The EQ system not only amplifies the car?s rate of acceleration, it is also capable of taking over for the engine when cruising in a steady scenario, delivering the benefit of enhanced fuel economy. The Mercedes team speculates that the performance of this new powertrain will at least be equal that of the current 4.7-liter, 402-horsepower V8. The hybrid system provides instant acceleration, while enabling fuel-saving via its automatic engine start-stop function. The engine is mated to a 9-speed automatic transmission and the consumer may choose between a rear-wheel-drive system, or Mercedes? 4MATIC AWD system. 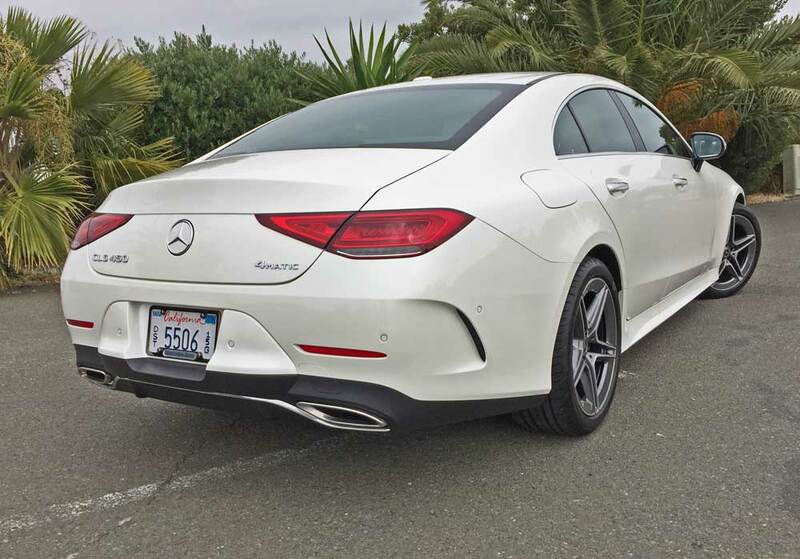 This latest iteration CLS coupe lifts styling cues from the GTI, displaying the same long hood and the wide grille flanked by the slanted LED headlights ? projecting a sort of bold and sinister look. The CLS showcases a generally racy image with the lower fascia also drawing its inspiration from the AMG GT, with oversized, integrated air ducts that wrap around almost reaching the 19-inch AMG star-spoke alloy wheels. The aft end of the CLS received a modest lift for 2019, but loses some of the aggressiveness found in its predecessor. The pronounced arc of the roofline adds to the aero-dynamacism and coupe-like profile, but intrudes somewhat into the front and rear headroom. 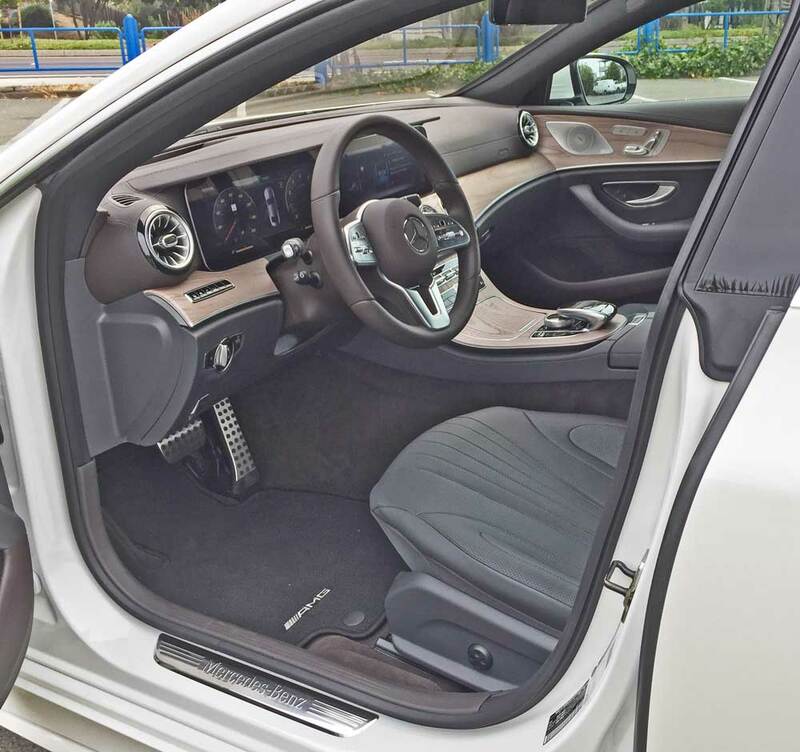 Moving into the cabin, the CLS 450 serves up just about everything that one could want and that Mercedes has to offer in the way of creature comforts and conveniences. It provides exquisitely comfortable sport seats that are upholstered in fine Nappa leather and that offer full automatic adjustment with position memory, delivering heat, ventilation, as well as a massage function. An adjustable thigh bolster and lumbar support complete the comfort personalization experience. The car?s aromatherapy system is integrated in the climate control and includes scents that may be purchased from the Mercedes dealers. What?s not offered however, is the CLS is Mercedes? brand-new M-B-U-X technology interface. 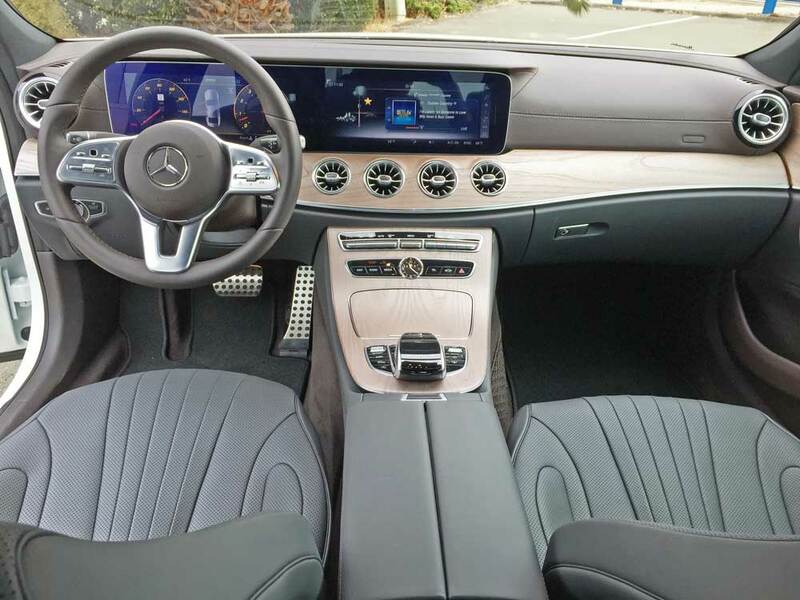 The CLS 450 still comes with the older COMAND system, which is still very good, and offers navigation, feature controls, and music through an ultra-wide 12.3-inch video display screen. The technology found in the CLS 450 ranks among the best in the luxury car segment, including semi-autotonomous driving technology. The COMAND navigation system is displayed on the 12.3-inch screen, which is controlled by a dial joystick on the console. Both Android Auto and Apple CarPlay are supported, along with Satellite Radio and streaming audio. An additional 12.3-inch screen is optional, and replaces the driver information display with an all-video presentation, which is not a touchscreen even though it appears to be. The CLS450 is also available with a clear and bright head-up display. The dash is a mixture of bright digital screens (with a 12.3-inch gauge-cluster screen as standard, while a larger infotainment screen is optional), wood and metal trim elements, along with circular turbine-like air vents. Inputs are acomplished employing steering wheel thumbpads, center stack buttons, with a console mounted knob and a touch-sensitive pad above that. 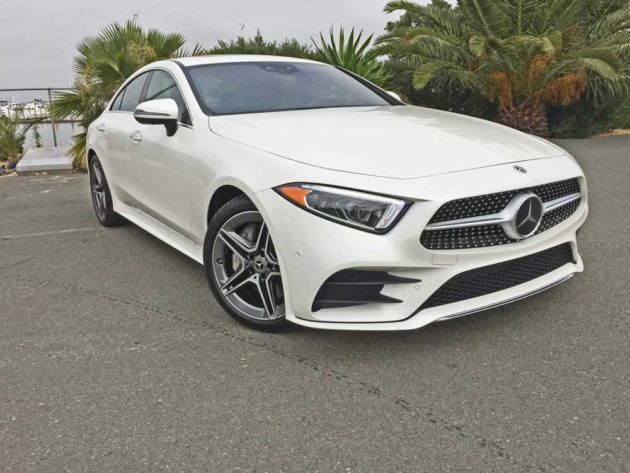 My test 2019 Mercedes-Benz CLS 450 4MATIC Coupe wore an exterior finish of designo Diamond White metallic, complemented by a Magma Grey and Espresso Brown Nappa leather, accented by Light Brown, natural grain Elm wood trim elements. Official pricing is not yet available, but last year?s base price was set at $75,000. 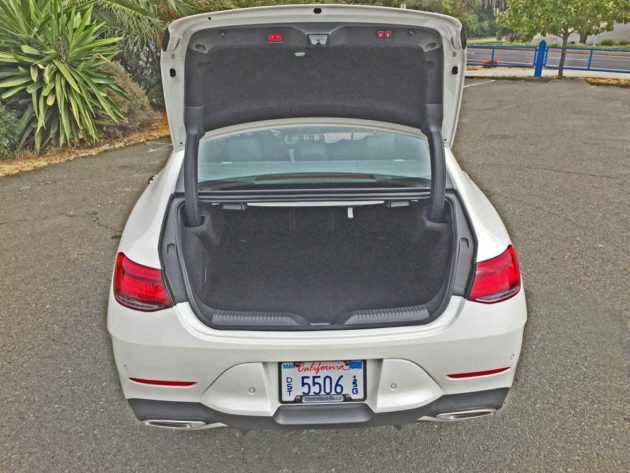 Fully loaded with the options that my test car was outfitted with, the final tally would likely be in the $100,000 range. 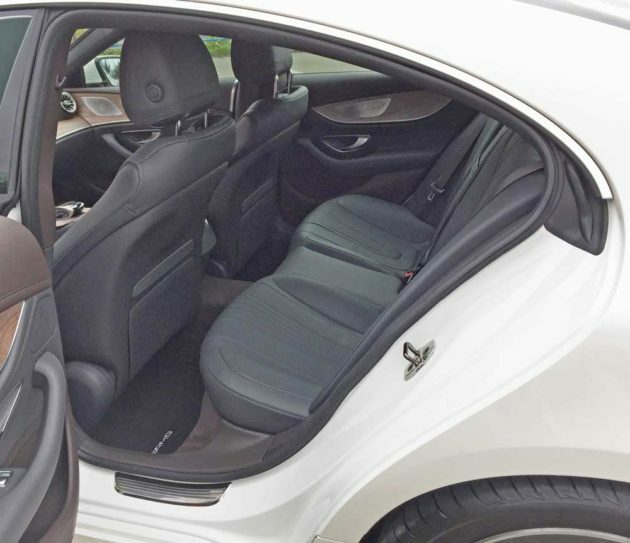 The third generation Mercedes-Benz CLS 450 4MATIC coupe as already stated, is 5 passenger luxury sport sedan with a 40/20/40 fold-down rear seat that contributes functionality. The power delivery of the longitudinally mounted front 3.0-liter, DOHC, 24-valve, twin-scroll turbocharged inline six-cylinder engine is smoothly supplemented by its 48-volt mild hybrid electrical system. The nine-speed automatic transmission provides smooth but positive shifts, gearing energy to the 4MATIC AWD system. Customizing or setting desired levels of performance may be accomplished by selecting one of the five drive modes including: Eco, Comfort, Sport, Sport Plus or Individual regulating ride quality, damping steering input and shift points. This third gen CLS Mercedes has a lot going for it. Whether or not it will retain its popularity remains to be seen. Pricing will obviously be a determining factor. In any case, it is an attractive and luxurious sedan that leans more to the touring side of the equation than the sporty side. The 2019 Mercedes-Benz CLS 450 and CLS 450 4Matic models are due to go on sale in the last quarter of 2018. A special higher-performance AMG model will go on sale at the same time. Pricing has not yet been finalized, but will be announced before the 2019 Mercedes-Benz CLS 450 and CLS 450 4Matic models go on sale towards the end of 2018. Base Price: Official Pricing TBA. Current CLS MSRPs range from just below $76,000 to $78,345. Price as Tested: Fully loaded likely to be in the $100,000 range. Drive Train: Longitudinally-mounted front engine / Rear-wheel or 4-MATIC AWD system. A steel sport suspension with stiffer springs and damping is standard, which lowers the Coupe by .6 inches compared to the Sedan, and electronically-controlled, continuously adjustable AIRMATIC air suspension on the front and rear axle damping for the front and rear axles is optionally available. Brakes: Power-assisted four-wheel vented disc brakes with ABS, Active Brake Assist, ESC and more. Tires: Goodyear Eagle F1 245/40 R19 98Y Front / 275/35 R19 100Y Rear ? 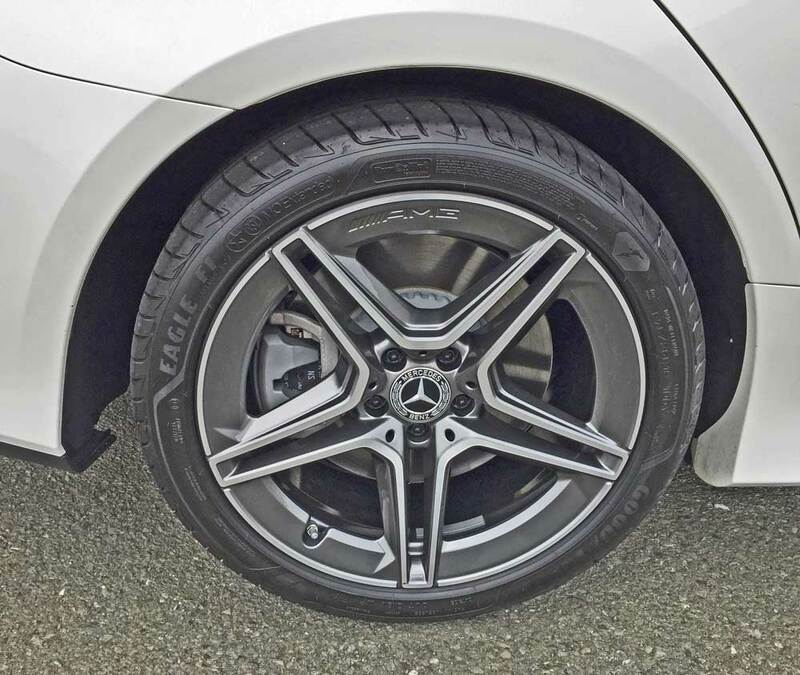 mounted on AMG 5-?Star?-spoke alloy wheels. 2018 Maserati Levante GTS, Part Ferrari, Part UV all dream car!